Mueller Water Products, Inc., is launching the Super Centurion A-403 Fire Hydrant that is designed to be installed and maintained by one person. In addition, Mueller is expanding its 250/300 Resilient Wedge Gate Valve product line with a new end design. The Super Centurion features a two-piece ductile iron upper barrel with a nozzle section that can be separated from the traffic section by removing two high strength bolts, making seat replacement or traffic repair simple and quick. 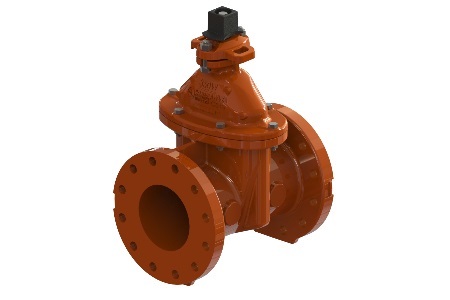 The A-403 has a traffic flange, 5-1/4” fully encapsulated, reversible main valve, a durable polyurethane top coat, and automatic oil lubrication. In addition, all internal components, nozzles and repair parts are fully interchangeable with the Super Centurion 250 hydrant. Initially, the A-403 is available with a 5-1/4″ main valve and a 3-way opening configuration (2 hose nozzles / 1 pumper nozzle). This lightweight dry barrel fire hydrant is certified UL/FM/AWWA at 350psi operating pressure and factory tested to 700psi. Mueller Water Products Inc. is a leading manufacturer and marketer of products and services used in the transmission, distribution and measurement of water in North America. Our broad product and service portfolio includes engineered valves, fire hydrants, metering products and systems, leak detection and pipe condition assessment. We help municipalities increase operational efficiencies, improve customer service and prioritize capital spending, demonstrating why Mueller Water Products is Where Intelligence Meets Infrastructure®. For more information, visit www.muellerwaterproducts.com.